Acer has announced the latest in its Timeline series of thin, light and power-frugal laptops with a UK release date of May. The Timeline X (meaning 'excellent') promises up to 12 hours of battery life. We will need to get our hands on the laptop to be sure of that claim, but the machines do boast various power saving options including Acer's own PowerSmart and backlit LED panels boosted by Intel Display Power Savings (iDPS) guaranteeing the same image quality but using 30 per cent less power. Prices start at £599 and there will be up to nine variants. The original sell of the Timeline range was that the laptops were powerful while having that all-important lengthy battery life. Acer has supplanted the low-voltage processors in last year's range with variants of Intel's Core i3, i5 and i7 processors. Graphics and sound are also pretty serious, with AMD's Mobility Radeon HD 5000 series graphics alongside Dolby Home Theater v3. Dimensions are also small (24mm thick) - but the weight isn't too low, between 1.8Kg and 2.4Kg. Sizes vary from 13.3 to 15.6-inch screens. There will also be a 11.6-inch variant available at a later time, says Acer. That'll probably hit the streets in June. 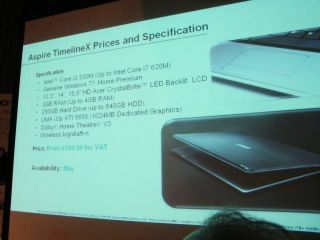 The company also officially announced the Acer Aspire Ethos line, with two new models, the 8943G and 5943G. Both are designed for entertainment, with 5.1 surround, AMD Radeon 5000 series graphics and processors up to quad core Intel Core i7. TechRadar will be getting its hands on the new laptops soon - so watch out for our review.